This is the perfect meal for the Halloween midterm break, as it's fun to do as a family or with friends and it's as easy one pot wonder to boot. This dish is a take on an amazing meal I had in Barcelona when I was 16. I have never quite managed to get it as good as that one, but I always love trying to. Scrub the mussels well, then place in a large bowl and soak for 30 minutes. Drain and set aside. Place the largest pot you have on a medium heat. Add the oil and allow it to warm up, then add the onion and cook for about 5 minutes, until soft. Add the carrots, leeks and garlic and increase the heat a bit. Cook for a further 4 to 5 minutes. Stir in the white wine and increase the heat to let it bubble up for a minute, then add the tinned tomatoes, tomato purée, paprika, cumin, half the parsley and half the coriander. Add the mussels and cover with a lid. 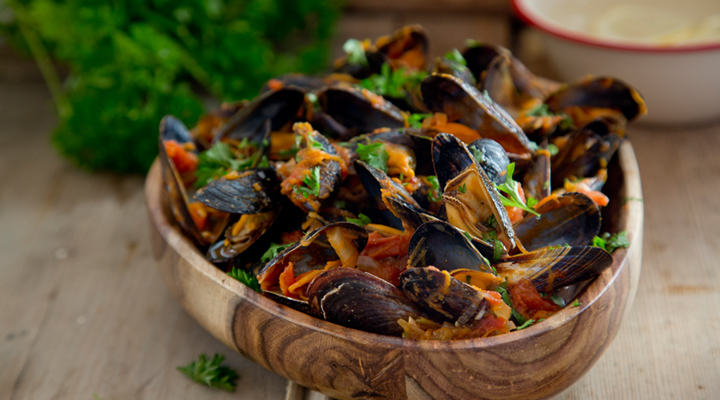 Cook for 3 to 4 minutes, until all the mussels have opened (discard any that have not). Add the remaining parsley and coriander and season to taste with salt and pepper. Serve in a wide, shallow bowl with a slice of toasted crusty bread spread with garlic mayo alongside.